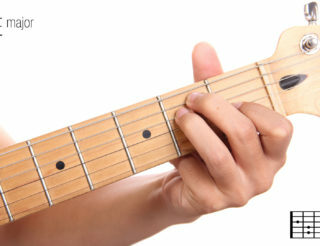 Grunge music is known for rather simple, yet unorthodox chord progressions. “Black” is from Pearl Jam’s debut album “Ten” which was released in 1991. Featuring lyrics dealing with a failed relationship, the song employs guitar ideas reminiscent of Stevie Ray Vaughan, but instead of being based on pentatonic colours, they rely upon simple chord embellishments. Animated by the commercial success of the song, Pearl Jam’s record label suggested the song be released as a single. Due to the personal nature of the lyrics, the band refused. The song is a conjoint effort by guitarist Gossard, who came up with the music for the song, and Vedder, who wrote its lyrics. Along with other accolades “Black” was voted the 9th Best Ballad of All Time by Rolling Stone. 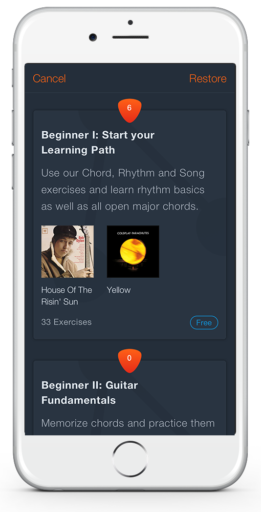 You can learn to play Black by Pearl Jam with guitar chords, lyrics and a strumming trainer directly in the Uberchord app. The song can be considered polytonal, with strophes in the Key of A major and pre-choruses and chorus in E minor. The song is introduced by a V7 – I – turnaround in the key of A major, which yields E7 – A. In the verses, this idea is expanded upon by means of layered guitars. In the pre-chorus, there is an abrupt modulation towards E minor as well as a commonly used turnaround, a VI – i. 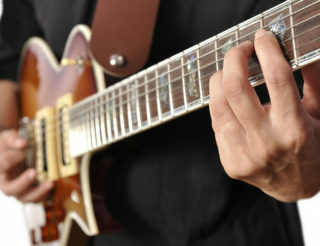 The song is fairly easy to play and you need not use a capo nor change your guitar’s tuning.